Well, the plateau has finally provided some descent. I dropped back down 2.5 pounds since yesterday and am now back over the 14 pounds down over the last 21 days. It has not been fun!! For lunch today we had Moong Dal Tadka ( see Moong Dal Tadka recipe). 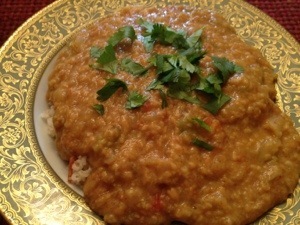 This is a tasty Indian vegan recipe made with Moong Dal (dried and split mung beans) and lots of spices. 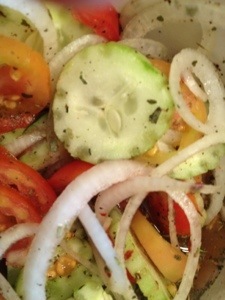 We also had a splendid cucumber/tomato/onion salad in vinegar with an Italian herbs and spices mix we got at the local Farmer’s Market. This was a nice healthy robustly tasty meal. Thanks to my sweetheart Julianne. The TLC ingredient makes all the difference! Now, on to a new week of some new weight loss! !